What does Gestalt theory tell us about optical illusions? The Gestalt theorists were fond of optical illusions as they illustrated how the mind actively organizes perceptual information. The fact that we can see something that is not really there shows that our perceptions are more than an exact copy of reality. 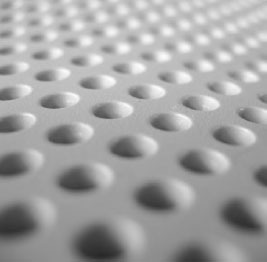 In the photo to the right, a field of rounded dots can seen as either convex (rows of buttons) or as concave (rows of holes). Notice that you can perceive either buttons or holes but you cannot perceive both at the same time. In order for your perception to switch, you have to look at something other than the dots, such as the flat area between the dots. A field of dots can appear to be either convex or concave, depending on one’s perception of them (iStock).